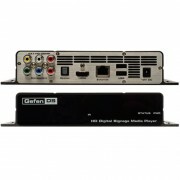 The HD Digital Signage Media Player provides an effective means to play and schedule digital signage content with both digital and analogue connections. By connecting the HD Digital Signage Media Player to a network, content can be “pushed” to the box using a computer and FTP client program. When a more elaborate setup is required, a number of units can be configured to “pull” content from a local or external FTP server based on a schedule. The HD Digital Signage Media Player acts as both an FTP client and server with live logging of various important statistics, such as playback, system status and uploaded content. The HD Digital Signage Media Player provides an intuitive directory and file structure that can easily be created and maintained by any text-based editing program. This allows you to concentrate on the important task of content creation. Many audio and video file formats are supported with NTSC and PAL output resolutions up to 1080p Full HD. 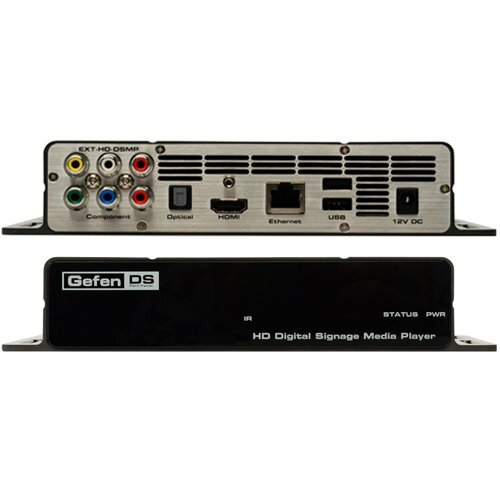 HDMI, Composite and Component outputs with separate analogue and digital audio outputs provide flexibility when connecting to various displays. Two USB 2.0 ports provide connection to the included USB flash drive or to an external hard drive. For precise time synchronization, the HD Digital Signage Media Player can be set up to access an external NTP server. The HD Digital Signage Media Player enclosure features integrated mounting brackets for a secure installation on any flat surface or directly to the back of the display.